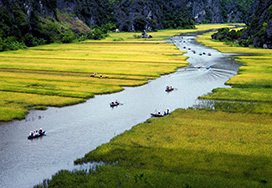 8.00 pick you up at your hotel in Hanoi to Ninh Binh. After 2, 5 hours driving southward, we arrival Tam Coc wharf, get on the boat row while this area is still not busy, we will enjoy nice and quiet riding long river through 3 tunnel cave, consisting of the Hang Ca, Hang Hai and Hang Ba grottoes. These caves are adorned with beautiful stalactites and stalagmites of different shapes and colors that sparkle like gemstones. After 2 hours boat ride we get back on the shore, have lunch in local restaurant close by, afterwards we will go to visit Hoa Lu Ancient Capital with 2 temples of the Kings Dinh and Le before heading back to Hanoi. Evening, pick up at your hotel then transfer to the station for a night train to Lao Cai. Overnight on soft sleeper berths cabin to Lao Cai. We arrive Lao Cai train station in the early morning. Pick up and driving to Sapa, it takes us around one hour to make our way up the mountains. Once at Sapa, we have breakfast (we will have room if it is available - but the check in time after 12:00). We embark on a lovely walking tour to the hill tribe village of Cat Cat, home of the H'Mong hill tribe minority people. As we walk to the villages nestled in the valley below Sapa we will meet some of the local minority people on their way to and from Sapa. Here we have the opportunity to share cultural experiences with families that live in the area. Get up in the early morning and enjoy the fresh air and the daily life at Sapa market. Back to hotel for breakfast. At 9.00 we embark on a lovely trek that will take us along buffalo paths and trails and through several hills tribe villages Lao Chai & Ta Van, home to Black H'mong, and Dzay people. This is an absolutely spectacular walk through stunning scenery inhabited by some of the friendliest people you can meet. Once on the valley floor you can really appreciate the wonderful scenery that surrounds you. The walls of the valley are covered with multi-layered rice terraced fields and scattered villages. We back to Sapa in the afternoon and wait for your transfer to the station for night train to Hanoi. End of all the services here.